This may be totally the wrong forum because I'm not trying to make a sale but I had no clue where to put this . I have gotten really in to building things lately and even DH is really enjoying it. So we made a dinning room table and are now tossing around the idea of selling them. Because of the area we live in though I have more reservations than DH about jumping in to something like that. So I figured I'd ask you guys what you would pay for a table like this to get a feel for what we might be able to price them at if we did it, because I have no idea where to even start. I'm such a cheapskate that I'm not your target audience But I've seen pieces like that in the 700-1000 range. 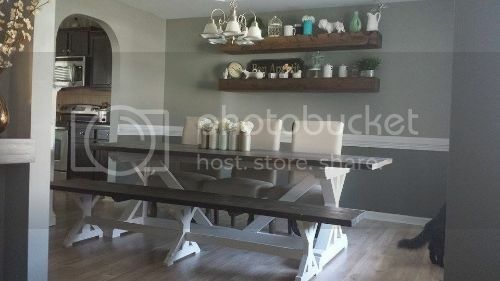 I am a cheapskate too which is why I had no idea where to start with pricing, the table and the bench only cost us around $110, though if I made them for other people I would buy better wood so it would probably cost more around $200 to make with quality materials. If I had the money I'd probably pay somewhere between $500-700. Maybe more if I knew I could get it stained a certain way, etc. I can follow plans but I don't know if I'd be able to come up with my own! Ana White plans are inspiring my whole house! I could definitely stain/paint them to peoples preference! Pottery Barn makes a similar product so you could base your price off of what they're selling theirs for. Also, check what they're going for on Etsy. I'm positive you could get, at the very least, way more than $500 for that. I think you could get at least $750-$1000 for just the table, assuming the table top is well-finished and a good, solid piece of wood. And another ~$250+ for the bench. Thank you!! I guess we could do it if we could sell them for $500-$600 a set with color customization. I had no clue Etsy had big furniture like this! Going to have to check that out, thank you! I hope one day you can try out her plans, so easy and beautiful pieces. Yeah, I only recently found out they sold furniture. I have no clue how they ship it though! And I can't wait either. That woman is a genius!